I went out to get the mail yesterday and had to run back in to grab my camera. Dramatic clouds after a brief hail storm. A stressful week in many ways, and I’ve spent way too much time online following the news and thinking about the sorts of things that bring down Presidents. The Watergate hearings are my first memory of paying attention to politics and I’ve got quite a significant case of déjà vu happening right now. A bit of political ephemera I inherited from my father, another political junkie. On the home front, a couple of fun things came in the mail this week. Been lusting after this pattern for a while and finally decided it was time. I had to order some boring black rayon/lycra knit to combine with some of my other knit pieces and I was unable to resist the lure of the Hello Kitty cotton knit. One of my favorite dinners this week–started with this chicken on a Greek pita with veg and topped with this sauce and some feta. Saturday evening sewing. I have obviously not yet learned important life lessons regarding: 1) NEVER use heavier fabrics like purple twill for a bag pattern that calls for quilting cotton, and 2) NEVER use contrasting thread for topstitching. On Saturday morning, I took a bus tour through the older parts of Richland, the next town over from where I live. Someday I really must do a long post on the history of this area (which is super-interesting, at least to me), but here’s the condensed version. In 1942, the U.S. government chose a parcel of land in eastern Washington state to be the site of a plutonium production facility as part of the Manhattan Project to develop nuclear bomb technology. At that time, there were two small farming communities there, the towns of Hanford and White Bluffs, plus a few Native American settlements. The few thousand residents were paid for their land and given 30 to 60 days to leave. The feds brought in workers from all over the country to raze the towns and construct in their place plutonium-producing nuclear reactors, plus everything that would be needed to house, feed, transport, and entertain hundreds of employees in the middle of the desert. There was literally nothing and nobody out there, which was by design, as the project was top secret and even most of the people employed at the site didn’t know what they were working on. The tiny town of Richland, Washington, was unincorporated and became the new home of these workers. Saturday’s bus tour was to look for remnants of World War 2 and Cold War construction projects in the midst of modern Richland. Here’s the bus in front of the Reach museum, which organized the tour. It dates from the early 1950s, and was used to pick up workers in Richland and ferry them out to the Hanford site. How things have changed–the bus has ashtrays! This is one of the H houses built between 1943 and 1945. Each of the different house floor plans was designated by a letter of the alphabet, so they’re now called Alphabet Houses. This looks like a B duplex; the windows have been replaced and the house appears to be in pretty good shape. There were originally about 1,000 duplexes–most are gone and many of the remaining ones are a bit run down. I think this is an A duplex. Note the detached garage at the right; that would be a later addition, as none of these houses had garages. Richland also still has a theater, a shopping center, a federal courthouse and some other structures built by the government during this period. And the parcel of land that the government bought all those years ago was back in the news this week because of the mess they made out there and are still trying to clean up. A big thank you, as always, to Natalie over at Threads and Bobbins for starting Sunday Sevens and keeping us all grabbing for our cameras. Have a great week, everybody, and keep well away from any 20-foot pits filled with radioactive material, okay? I’m trying to get back into a more regular posting schedule here, so I thought I’d take up doing Sunday Sevens again. It’s a good place to put those sort of random interesting bits and pieces of your life (and I am all about random). My pictures this week are actually going to be highlights from the last few months, as I’ve got a bit of a stockpile at the moment. As always, all credit goes to the ever-fabulous Natalie of Threads and Bobbins for getting Sunday Sevens started! First, let’s go alllll the way back to Xmas, because I made a couple of pretty cool gifts that I never managed to blog about. For my sister, I made some unpaper towels and a fabric basket to store them in. I braved the big Thanksgiving sale at Joann’s to get these really fun flannels (this is a pretty serious level of dedication for me), then I matched them up with cute cottons from the stash. I’m really liking the basket idea for these, and want to make one for my own unpaper towels one of these days. I get that people like rolling them up and storing them like paper towels, but it kind of makes them a pain to use. The basket is a better way to store them, I think, if you have the counter space for it. I also made a charging station for all my partner’s gadgets. Yeah, it’s a little droopy. Obviously I needed a stiffer interfacing. 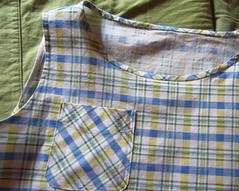 I sewed along the corner seams and that helped it sit up a bit better. I made this to fit the shelf where he keeps all his bits and pieces that require charging (which is currently a tangle of cords). I made buttonholes of various sizes along the back to put the plugs through. He has yet to put this to use (he’s planning to organize his office, but it’s a bit of a big project, if you get my meaning), but I think it’s going to eventually be really handy. The execution on this could use a little work, but I really like the concept. Now for some demos! Three so far this year, I suspect many more to come. In mid-January, the Democratic Party called for demonstrations in support of the ACA (Obamacare), and I went to the one in Richland (next town over). At the last minute, my honey decided to come with, but warned me that he thought we might be the only ones there. Eastern Washington state is pretty conservative–Republicans outnumber Dems 2-to-1–and it was 15F and snowing that day. For some reason, they had us gather on the outdoor stage, and it was covered in a sheet of ice–I’m kind of amazed nobody slid off the edge of the stage–but folks were undeterred and fired up! Then, the following weekend, partner and I drove to Spokane for the Women’s March. Some folks had thrown a local event together at the last minute, but they planned to walk a labyrinth and meditate, and no way did I want to meditate–I wanted to yell! So we went to Spokane and it was an amazing experience. 2,000 people were expected, but as we drove through downtown, I thought it sure looked like a lot more than that. When we lined up with the huge crowd at the start, a woman we talked to told us that they had stopped letting people into the Convention Center for the pre-march rally when they reached 5,000 people in there. News reports afterward estimated 8,000 attended. And I should have pictures for you, but my camera would not cooperate. Sigh. But we marched and it was great–so much positive energy and determination to fight for what’s right. Great mix of all ages, races, genders; it meant a lot to me to see all those people come out for this event after the horror of the election. I was expecting some counter-demonstrators, but the only ones I saw were at the start–three or four young dudebros snickering on the sidelines. One of them yelled out something about “making it great again,” but was ignored. It felt like it was finally OUR time to be heard, not theirs. Did get the camera working for this shot of the park with decorations appropriate to the occasion. Finally, last weekend, our local Indivisible group organized a town hall at the Washington State University Tri-Cities campus. Our local Representative–I feel like that word should be in quotes–is Republican Dan Newhouse, and he is one of the 200 or so Reps that are refusing to hold the traditional town hall meetings in their districts. So we held one without him. Constituents asked him questions that were videotaped to be delivered to his office. Great idea, well-executed, and lots of smart, well-informed people there to keep the pressure on him to do the right thing. I also took the opportunity while I was out there to take a walk along the river path and snap a few photos. I love these, but the best thing about them is that they swivel around their poles when the wind blows! Looking across the Columbia River. Next event is a rally on Wednesday for International Women’s Day. We are keeping the pressure on and the energy up! Have a great week, everybody, and take care of yourselves. Happy bears make everything better. It’s been a supremely weird, discombobulating couple of weeks, hasn’t it? I actually wrote a long, long post about the election the other day, but then decided it was so “inside baseball” that it was probably interesting to nobody but me. I felt better having written it, and that’s enough. All I really want to say about the election, and our rather uncertain future, is this: President Obama was on a conference call the other day with some Democratic activists and he told them that they have until Thanksgiving to mourn, then it’s time to get to work. And, while I’m doing that, thank goodness there’s sewing, and cats, and fall weather, and delicious food, and all the pleasures of life. The American Thanksgiving is coming up this Thursday, and my honey and I will eat too much at the buffet, take a walk in the cold, and then come home to mulled wine, an afternoon nap, and sleepy cats on the bed with us. On the sewing front, much has been happening here. I finished both the vest and the red fuzzy jacket, though I haven’t gotten around to taking pictures of them yet. I have reservations about both, but I probably need to actually wear them out of the house before I decide what I think. In the meantime, I’ve started work on my partner’s cycling jersey, which then promptly came to a halt when I realized I’m out of narrow elastic and the zipper I bought for the jersey isn’t long enough. Also, my plan for the extremely fabulous corduroy has changed again. I’ve had such a hard time committing to a pattern for this, I think because it’s such a great fabric and I don’t want to waste it. I love jumpers because I can layer them and change how they look, but I wanted something really interesting and non-frumpy for this one. 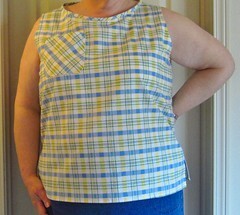 I’ll have to lengthen it a bit, but I should have enough fabric to do that. No, not the fabric model–look at all that color around him! This is a really unusual cotton that I bought at a quilting store years ago. It’s magenta at one selvage, then shades to purple, blue, green, and finally dark gray at the other selvage. I had figured I’d use it as a quilt backing, but I think it’ll make a cool lining for my cool ’60s style jumper. This Hello Kitty remnant has simply GOT to get combined with some other fleece pieces–I’ve got light pink, dark pink, orange, white, and black–to become a pullover. I’m not sure why, but I’ve been dreaming of colorblocked fleece (and grabbing fleece remnants at SCRAP) since the middle of last summer, and fleece season is finally here! And I really need me some cute and colorful and silly right about now. So I’m hoping to get the cycling jersey done this week, then get to the Hello Kitty pullover. Hope all is well with you folks. Back soon with project pictures. The very wonderful and talented Natalie over at Threads and Bobbins has nominated me for a Very Inspiring Blogger Award! “So, what is the Very Inspiring Blogger Award? 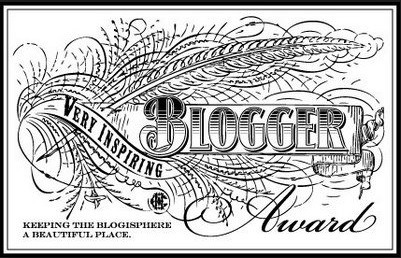 The Very Inspiring Blogger Award is an award given to bloggers from fellow bloggers. It recognizes bloggers who work hard to keep the blogosphere a beautiful place. 1. “STH” has nothing to do with my real initials; it stands for “struggling toward hope” and has been my online handle for years. I struggle every day with mental health problems, but I’m always working toward becoming stronger, healthier, and happier. I try to stay anonymous online so that I can write as honestly as I would like to about these and other issues. 2. My past jobs have included working in Human Resources in a beef processing plant (read: slaughterhouse) and writing logic questions for the Law School Admissions Test. Pro tip: working in an office full of beef salesmen is a good way to pick up new beef recipes. 3. I generally prefer animals to people. If I come over to your house, please allow me to cuddle your pets (expect maybe if you have tarantulas or something). 4. If you have tarantulas, I’ll probably still pet them. 5. I have lived in 6 different U.S. states. 6. I really love Douglas Adams and re-read “The Hitchhiker’s Guide to the Galaxy” every time I find myself stuck in bed with a cold. 6. I can resist temptation in the form of sweets, but no potato chip is safe around me. 7. I sleep best with a cat on my head. Pattern Vault — Such an amazing resource on fashion history; reading this blog’s well-researched posts always gets me thinking about new ways to use fabric and incorporate interesting details into what I make. My Vintage Inspiration — S inspires me to be a better writer with her wide-ranging, evocative posts. Each one makes me wish I could sit down with her over a cup of coffee and chat for hours. Minki’s Work Table — Incredibly detailed needlework done in a very unique style. Sweet and colorful little still life paintings in fabric and thread. Gayle Ortiz — Wonderful creativity and amazing shapes here. This vest! And this one! Diane Ericson — And so many more amazing ideas here. 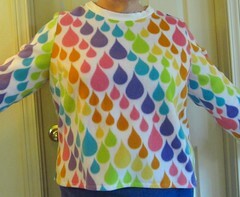 I seriously need to take on an ambitious project like this shirt. Crafting While Anxious — Another wonderful writer, who writes movingly of her personal struggles (and also makes beautiful, beautiful things). My OBT–Regularly expands my horizons (and keeps me from getting too tunnel-vision about sewing) by showing me all kinds of amazing artworks and music and other various beautiful things. Perry Street Palace — Iris Vander Pluym’s palace of social justice, righteous outrage, and snark. This post on abortion–well, just read it. Captain Awkward — the place where I have learned many of the grown-up coping and assertiveness skills I should have learned years ago. Whenever I get up the courage to use my words (which is not nearly often enough), it’s largely because of the teachings of the Captain. ETA: Added quotes to show what I copied from Natalie’s post (sorry, Natalie–that was very sloppy of me) and corrected the date of the post. I thought perhaps us lefty types could use a little good news this morning. 1. Two statewide “personhood” initiatives were defeated yesterday. 2. Dallas joined Houston in enacting protection for LGBT employees. 3. Cities are beginning to turn against fracking. 4. Alaska, Oregon, and DC have legalized pot. 3. Washington was the first state to institute universal background checks for gun purchases. Another initiative, a deceptively-worded one meant to keep the state from enacting any gun control measures, went down. 4. In my Congressional district, Washington’s 4th, two Republicans were vying for the seat of retiring Rep. Doc Hastings. At this writing, the “establishment” Republican is in the lead, and the Tea Party wanker is losing. I’m particularly enjoying this, as the aforementioned wanker, Clint “vote for me because I played football” Didier has been running for various offices here for YEARS. (I think last time it was “Commissioner of Public Lands.”) Every election, they bring out the same signs, with a new sticker showing the position he’s running for this time. He’s lost over and over. This was Didier’s best opportunity yet, in a heavily Republican district full of Obama-hatred and THEYRETAKINGMYGUNS hysteria, and it looks like he’s going to lose again. I hope everyone will get out and vote on Tuesday, if you haven’t already. Even if you have to hold your nose and vote for the less awful candidate–as we had to do here in Washington’s 4th Congressional district–it’s important to do it because the awful candidates in this election are REALLY awful. But we also have the chance here to vote for universal background checks on gun sales, and other states have similar referenda on their ballots. The average person doesn’t have much power to influence things, so you better believe I’m going to use my vote to do what I can to make the world a little better. I hope you will, too.